In order to find a value, you must determine exactly what is it that you are researching. Some patterns are more in demand than others. What was hot last year may not be as popular this year. Values can vary by region. A pattern that people who live in England love may not garner interest in the American West. In general, Flow Blue values have diminished since the big collecting craze of the 1990s. The aging collectors are downsizing, so a lot of the product is on the market. Younger people are not as interested in Victorian, flowery or fussy china and lean more toward mid-20th-century products. Value is a complicated issue. Sites like Replacements state retail value, that is how much a product will cost to replace at retail. This is the value you need for insurance purposes. There is a difference in what you will earn from a sale to a private collector, at an online auction site, to a dealer, or at auction. Remember that any dealer will need to cover overhead and will want to make a profit. When you state that you have a complete set - what does that mean? 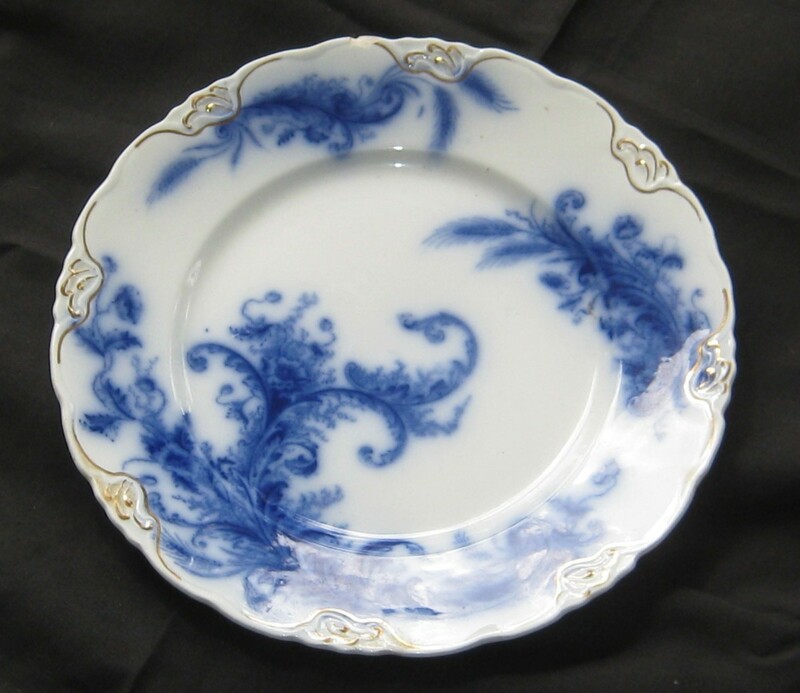 China manufacturers offered dinner plates, dessert plates, luncheon plates, platters, bowls, cups and saucers, sugar bowls, teapots; the list goes on and on. The value of individual pieces will vary as well. While tons of plates may have been produced in a particular pattern, fewer things like soup tureens and teapots were made. Also, pieces that have handles, lids, and spouts easily damaged or pieces lost making them more valuable. You may want to visit a Flow Blue convention or show. Learn as much as you can about your collection as well as the market. Only then can you determine the value.